As for the pin ring thing, most certainly can be a texture and that's preferable. I will replace is with a texture based one when it comes time to texturing. I'm not as fast with texturing, but I'll get there! which models do you want to see wireframes of? Or do you just mean all the models when I post pics to post wireframes too? Wireframes aren't of much use/interest to most people heh. Another quick post, this time before lunch.... repair factory! I know the models look pretty basic, but lots of details will be added with normalmaps etc. Should come out looking pretty good I reckon. Patience! I plan on making the game functional before i go in with texturing etc. So it shouldn't be too long before I can start on code. Nice repair factory, i'd call your models anything but basic... I guess I have very different expectations. At the moment i'm messing around to show my support. Last edited by Ravey on 2007-12-31, 23:04, edited 1 time in total. so you have experience with modeling , texturing AND coding?! But I think it?ll take you such a long time to do all this, won?t it? @Ravey: I think it shouldn?t be too lowpoly...but also it should be to highpoly... I actually don?t like high-detailed graphics. buman: yep I REALLY hope darkplaces can do everything I need, I'm really not up for coding my own engine but ultimately if that's what it comes down to, then unfortunately I'll have to do that or find a programmer to do it for me. Sorry for so many new posts. For those who think it's too much don't worry I will most likely post less from now on. Here's the vehicle factory, tomorrow I will make a tank, I won't post it though I will post once I have 3 tanks done. Electro wrote: Sorry for so many new posts. For those who think it's too much don't worry I will most likely post less from now on. No need to appologise, your models are always interesting to see. Also, I messed around with my robot a bit but I think i'll work on original characters for practice first. I do not have any experience in coding , but coding an own engine is a BIG thing , isnt it? We are coding our own engine, it is very slow and hard but interesting process, because we can make anything that we want. As I wrote in PM, Electro your work looks good! Good luck! The rest is still Quake for now, aside from the code base being stripped right back. Tonight I will be starting on some AI stuff, a lot of the code is in place now, but I should have dudes I can give orders to and they will run across the terrain etc within a few days. They will be smarter with navigating than the Z ones, which isn't necessarily a bad thing is it? Nice effect, reminds me of the amazing firework/explosion effects that Kingpin had for its time. so...is this project already dead? buman wrote: so...is this project already dead? Not dead yet. I've talked to him on MSN and he told me what he has been working on and shown me a few things too, but i'll leave it up to him to post when he feels he's made substancial progress in terms of making the game playable. I'll just keep my fingers crossed, anyways. Yeah I've already written a couple of thousand lines worth of code. Lots of groundwork is in place for the robot units now, including early navigation stuff (which also includes automatic understand of the levels on their part). The camera code is all done and has analog style behaviour near the perimeters of the screen allowing fairly smooth movement to move about the terrain. Currently I can select a single robot unit and click on a section of terrain and he will navigate there (he's still using standard quake assets for now). Today I will actually most likely be making a decent start on the grunt... here's what I came up with after mucking around a little yesterday so far..
You will notice the grunt looks slightly different to the original design, you will see this more and more as I show progress of the character. Attempting to modernize the design, as well as make the units on the ground have a more unique silhouette so that they can be easily distinguished and have more character. That's amazing, i'm really looking forward to seeing what you can come up with. As for the model, it's looks accurate to me, the lighting even reminds of how the sprites were shaded in the original game. 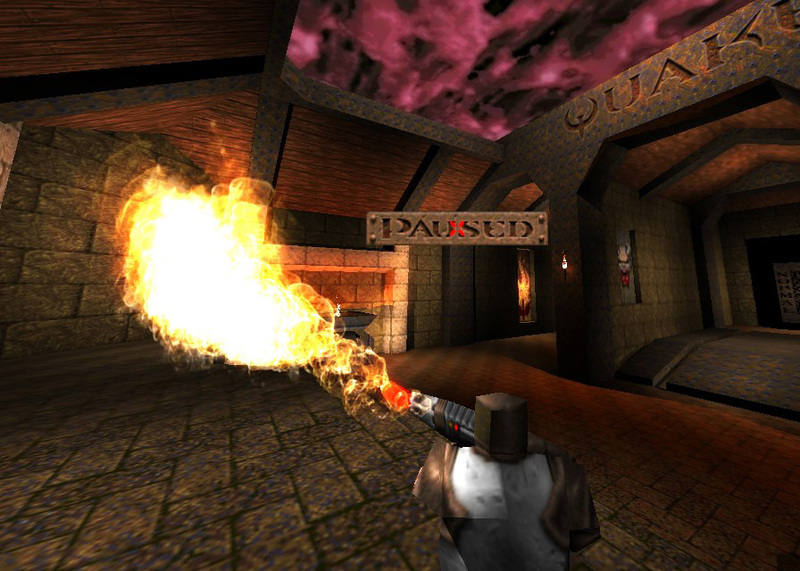 Hope it translates nicely over to the Quake engine.